It's finally here and I can hardly wait. It's been three long weeks since we last face Barcelona and won the game on a special night at the Grove. That night on February 16th will be etched into your memory as it is mine. A game of football I'll never forget and a night when the Grove came of age. Tonight we face the return leg of the tie. Win, lose or draw we can be proud to remember that against the best side in the world, our Arsenal team won the match. Obviously there was a huge boost given to the team as well as us supporters when it was revealed that Robin van Persie had first trained with the team and then flown to Spain. He is included in our 19 man squad which will be reduced to 18 when the team and substitutes are announced an hour before kick off. 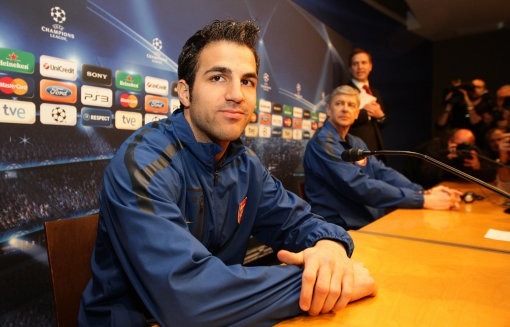 Arsene Wenger has revealed that van Persie will have a fitness test later today to ensure he is fit to play. The manager has said he won't take any risks with the player. "We will not take a gamble in a game of this importance. He will have to be fit or not fit." And although it is a huge surprise and boost that he's travelled, we should remember our season doesn't hinge on this one game. We've got an important tie with Manchester United in the FA Cup on Saturday and then a tricky away game at West Brom a week later. But if van Persie and Cesc Fabregas, who Wenger said is 90% fit, play tonight, that would make our chances of progressing in the Champions League higher than if we were without them. So whilst yesterday I thought it was a straight decision between Nicklas Bendtner and Marouane Chamakh for the striker's role, now van Persie is in the frame it makes the manager's decision easy. If Robin is fit, he will play. The other decision regarding team selection the boss has to make is who will play alongside Jack Wilshere in the deep lying midfield role. A simple choice between Denilson and Abou Diaby, as Alex Song has been ruled out. I think he'll plump for the Frenchman. I don't believe Wenger thinks the Wilshere/Denilson partnership has enough muscle. For captain Cesc Fabregas this will be the first time he's played at the Camp Nou. It will obviously be a big game for him and I'm sure that he'll lead us with distinction. He wants us to win it. "It is about us proving that we have what it takes to beat the best of the best. We should not rest on our victory in the first leg. The job is not finished by a long way. "In the first leg we proved once again we have guts and character. Just like we did last year when we came back from two goals down in the last half hour to draw. "This time we went one better. We won the game and this gives us hope and puts a doubt in their minds too." Barca are going to be without Carles Puyol and Gerard Pique at the heart of their defence but we know they've got adequate replacements for them. Tonight will about playing our game and ensuring we defend as a team. If we can grab a goal that will settle the nerves but as the manager has said, we can't go into the game looking for a draw. "Is it realistic to go there to try to play a 0-0 from the first minute on? First of all it would be considerably against our nature and even tactically I don't think it is defendable. "We have not a team with 11 defenders who are happy to defend." I imagine the tactics will be the same as they were at the Grove. Squeeze the play in the middle, allow Barcelona room in the wide areas because we should be able to deal with their aerial threat. Johan Djourou talks in The Sun about how we were able to keep Lionel Messi at bay last time and how we'll try and repeat that tonight. There was also some interesting talk in the Barcelona press conference when Pep Guardiola was asked to give his thoughts on Jack Wilshere. "Wilshere is a top player, and has been a big, big surprise. I didn't know him at the start of the season. "He had a really good performance. He can be a great player for Arsenal and England, but we have many types of player like him in the second team. "He's lucky as Arsenal have time. There is not the pressure to win titles as quickly as possible. We have second-team players like him." Barcelona are very lucky then to have many players like him in their reserves. Perhaps that's why they want to join Arsenal then? Because at least in north London you'll be given a chance. Those quotes certainly add a bit of spice to the game and I'm sure were designed to ruffle Wilshere. They know he's an important player for us and if he went out there looking to prove something to Guardiola there thinking might be that he'll lost his head. I'm sure that Jack won't let that happen. Well there is certainly lots to look forward to tonight. I'll post who I believe will be in the starting line up a bit later on. I know I won't be able to keep my mind far from the game. Work is going to be torture!